The horrific shootings at a movie theater outside Denver is shocking. As a nation, we again join in prayer for the victims of this seemingly senseless act of terror. The event again raises significant questions about our culture’s policies towards violence and firearms. While the details are still coming in about the incident, one thing is clear: our country has a problem with violence. We turn violence into entertainment (movies, video games, etc). We dehumanize both the victims and perpetrators in our sensationalized coverage of these events. We seem unwilling to even consider reasonable measures of gun control that are in place in almost every other developed county. As a nation, we make a fortune supplying weapons to the rest of the world and oppose international efforts to limit even the most horrific weapons such as landmines, cluster bombs, and other small arms. Because of our failure to intact reasonable gun control laws, thousands of guns from the United States leave the country each year to be used by criminal gangs in the drug wars in Latin America. In many ways, we are addicted to violence, and like many people who struggle with addictions, it is difficult for us to admit that we have a problem and it becomes easy for us to be manipulated by others and by cultural myths. But the limited amount of direct statements on this topic does not mean Catholic social teaching has nothing to say on the issue. In fact, the tradition is quite clear on its stance on human dignity, disarmament, peace, the common good. The foundation of Catholic social teaching is the dignity of the human person. Each person is created in the image and likeness of God (even the criminal). Killing, for self-defense, is allowed but only if it is the last possible means. The just-war tradition, as we know, allows legitimate self-defense as a last resort through proportional means. Catholic social teaching also strongly favors the role of state and civil society in promoting and protecting the common good—the individualistic vision of a frontier town where each individual has their own gun is not the Catholic conception of the common good. This may be why most traditionally Catholic countries, all but outlaw private handgun ownership. Beginning with John XXIII and up through the present pope, the Catholic church has been also strongly opposed to the trade of small arms, has strongly critiqued the business of weapons, and has strongly urged countries to disarm and stop the international trade of private weapons. The building up of arms, as the popes reminds us, does not assure peace. Peace, as the Second Vatican Council also stresses, is not simply the absence of conflict (see Gaudium et Spes, 78). Stockpiling arms, threats, and fear do not lead to true peace or security. Peace, the tradition tells us, must be based on justice and the common good. The creation of a more just national and international order with structures aimed at preserving the common good is the only way, according to the tradition, to have security. Pope John Paul II, as we know, often spoke about the culture of death and situated the international arms trade and addition to weaponry and war in that context in several messages to the UN and Papal Diplomatic corps. Many of these same principles on international peace are applicable to the personal level. Stockpiling arms personally, as evidence shows, does not make us as a community more secure. The nonpartisan Brady Campaign (named after the member of the Reagan administration severely injured by a bullet during the attempt on the president’s life ) explains how higher gun ownership in communities, in fact, raises the rate of gun-related crime and homicides. 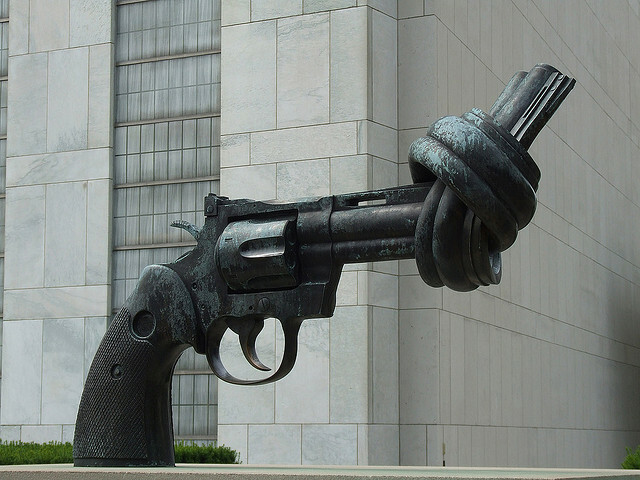 In short, the Catholic social teaching principles of human dignity, the common good, and peace challenge the individualistic ethos that underlines our gun politics. In one year on average, almost 100,000 people in America are shot or killed with a gun. 18,223 people who killed themselves and 3,031 people who survived a suicide attempt with a gun (NCIPC). 592 people who were killed unintentionally by a gun and 18,610 who were shot unintentionally but survived (NCIPC). Over a million people have been killed with guns in the United States since 1968, when Dr. Martin Luther King, Jr. and Robert F. Kennedy were assassinated (Childrens’ Defense Fund, p. 20). U.S. homicide rates are 6.9 times higher than rates in 22 other populous high-income countries combined, despite similar non-lethal crime and violence rates. The firearm homicide rate in the U.S. is 19.5 times higher (Richardson, p.1). Among 23 populous, high-income countries, 80% of all firearm deaths occurred in the United States (Richardson, p. 1). These numbers illustrate our problem and addiction to violence. Every few years, we seem to be shocked at high-profile events, like what happened in Denver, the shooting of Congresswoman Giffords, the tragic events of Columbine, etc. But we soon forget about it and move on to the next news item. I am not saying we must ban all firearms, but at the very least, we are challenged to reflect on our culture. As we hold the victims of gun violence in our prayers, what else might we do? First, all of us (myself included) need to rethink the place of violence in our entertainment. Killing is opposed to the Catholic vision of human dignity. Simulated killing, in many ways can also be opposed to human dignity. At the moment, I am seriously reconsidering some of the shows and movies I watch. And this is a difficult thing to consider when there are some very well-written shows that include violence. This does not mean, we should only watch children’s shows and the news. But we must ask ourselves, if what we watch honors or dishonors human dignity? Second, the time is ripe for the US Bishops to clarify and teach how we might address this challenge pastorally and politically? We cannot build a culture of life, if we ignore this crisis. This issue has come up in the past in 1975 and 1978, but their wisdom could be again helpful today. Finally, we need to find ways to have a serious, reasoned national discourse on these issues. This discourse must include those who favor more open gun laws, but it should also be free from the control of powerful lobby groups (sadly, all reasoned debate seems unlikely in our present political climate). As always, the views of this post do not necessarily reflect the views of other members of the Daily Theology group. I am curious to hear what other people are thinking? How can we prevent further unnecessary violence and death? How do we square violence in entertainment with human dignity? Thank you for this very pertinent and needed post, Kevin. I am always surprised just how quickly the public moves on and disregards the horrific acts of gun violence in the last few years. “This is simply something that happens,” is, I suppose, the common answer. This article from Fox news (that a friend sent me after I shared your blog) http://www.foxnews.com/health/2012/07/20/murder-at-movies-batman-didnt-do-this/ encapsulates the opposing point of view. It is the theological turn at its most difficult, I think, to switch from loving one’s neighbor on a person-by-person basis to confronting the larger forces and systems that can cause one’s neighbor to commit great acts of evil. I have yet to discover how to help people make this turn, since it can only be done if one keeps the person-by-person approach to Christianity close at heart, which of course is tricky business. However, these realities (like our willingness to accept waterboarding, partial-birth abortion, higher death rates for minorities, etc) reflect a broader structural issue or culture–which is why I quote John Paul II on this. We cannot accept murder and preventable death as the new normal.